Its that time of the year again where all makeup companies come out with gift sets, Yes!! Christmas is almost here. I had been eyeing this eyeshadow set since the day Priceline posted a picture of it on Instagram. Finally I found it and also found another gift set with face products too. I am talking about the Models Prefer Sweet Shadows and Models Prefer Sweet Kisses. There is another gift set launched by them which is a cute clutch purse with three makeup items in it. I did not buy that as I was more keen on getting these. When I first saw the picture on Instagram it reminded me of Too Faced gift sets. That was the primary reason I wanted to buy these. There were no testers in store so I could not swatch the shadows before purchasing. The sweet shadows gift set comes with 12 eyeshadows, 1 eye primer and 1 mascara and brow gel duo for $15. The eye primer feels smooth and dries matte. It does not have any tackiness to it like most eye primers have. Tacky eye primers help intensify shadows on the eye. I felt this eye primer to have the formulation of a face primer. The Mascara wand is a rubber wand with short bristles on one side and longer bristles on the other. I quite like the formulation of the mascara as it is a thick consistency. The Brow gel side has a normal mascara wand with clear gel. The eyeshadows have cute names and most of them fall under the mauves and purples category. The shadows are very chalky and don't have much pigmentation. You have to layer them 4 or 5 times to get the shadows to actually show up. In the pictures I had to layer the shadows 4 times to make them look close to color. Cute gift but not a must have. There are other gift sets from Models Prefer under the same price range which have better quality eyeshadows. When I saw this box I expected some lip products to be in there but there is none. Like the name Sweet Shadows had eyeshadows, Sweet kisses did not have any lip products. Instead it has face products like blush and bronzer. The eye primer and mascara duo is the same as in the Sweet Shadows. The duo eye brush is synthetic with one side shader and one side blender. It is quite a stiff brush and I personally will not use it. The highlighter in Macaroon is very powdery and has a slight sheen. It is not a very noticeable highlighter. The bronzer in Cinnamon Spice has a nice texture and is warm toned. It is not completely matte. The blushes in Marshmallow and Peach Parfait are hard and not very blend able. They are not at all pigmented. Even when I used my finger to swatch hardly any color showed up on my skin. All the eyeshadows are named after sweets and again not very pigmented. The 3rd and 4th columns of eyeshadows seem to have more color pay off than the first 2 columns. Again this is a cute gift but not something that will be of any use because there is no proper pigmentation. The tin boxes that these come in are reusable to store knickknacks. 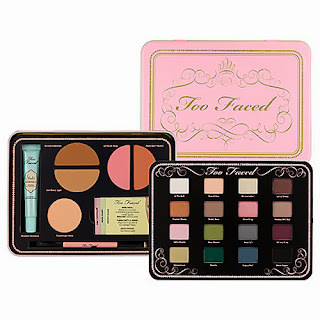 I was just looking through some pictures online and these gift sets are exact copies of Too Faced products. In terms of eyeshadow colors, Models Prefer tried to come out with almost exact dupes but unfortunately the quality just does not match up. These are just my first impressions and all eyeshadow swatches did not have a primer or base underneath. Maybe they will perform well with a primer, can't be too sure though. I really liked the quality of Models Prefer eyeshadow quads but these don't look like similar quality. Have you tried the Models Prefer gift sets? what do you think of them?? 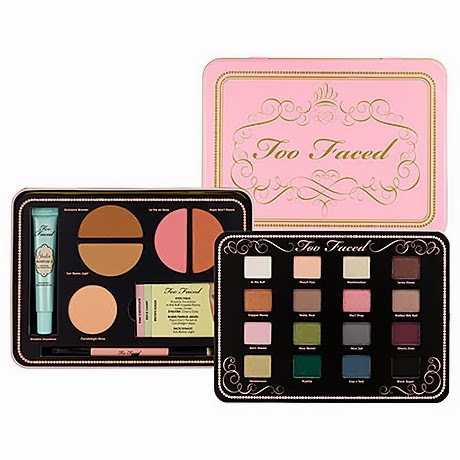 wow they are almost identical to the Too Faced palettes! They are really hard to pass but I just expected a little better quality. Maybe with a base they may work better. Let me know when you try them.